Drivers in America’s Sunbelt states are well familiar with the smell of melting car plastic on extremely hot summer days. As the sun’s rays beat down and temperatures rise inside sealed cars, dashboards and other bits can begin to cook. Americans, however, aren’t as accustomed to the phenomenon of the sun melting a vehicle’s exterior. But that’s exactly what happened to one British man’s Jaguar in downtown London recently. Last week, London resident Martin Lindsay parked his Jaguar XJ near the London skyscraper nicknamed “Walkie-Talkie” for its distinctive convex shape. When he returned to his car just two hours later. He found a photographer snapping pictures of his Jag. “The photographer asked me ‘have you seen that car? The owner won’t be happy,’” Lindsay recalled in a BBC interview. “I am the owner,” Lindsay admitted to the photographer. “Crikey, that’s awful,” Lindsay exclaimed as he surveyed the damage. Since the melting occurred, the developers covered the 946-pound repair costs ($1470 U.S.) and apologized to Lindsay. 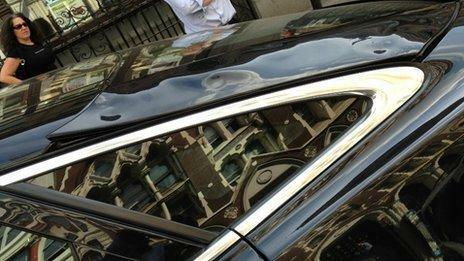 The City of London subsequently suspended three parking spots in the area most exposed to the building’s damaging reflection.